In recent years, many innovative sharing economy platforms (SEPs) had a strong impact on their stakeholders: service providers and consumers alike. Platforms change the economy: individuals renting out rooms or driving cars create competition for established hospitality and transport providers (as evidenced by the protests of taxi drivers in cities where Uber operates). SEPs also impact society as a whole: they prompt change in how people plan, travel, meet and eat. Their operation can modify social and economic environment in entire communities (think of Airbnb’s effects on cities’ housing markets and quality of life). How can platforms in the sharing economy deliver long-lasting value for their stakeholders and for society as a whole? RQ#1. How do sharing economy platforms create and distribute value? RQ#2. How to design effective and fair rating and review systems? RQ#3. What are the impacts of the pricing policies used in the sharing economy? We selected these research questions because they fulfil three important requirements: they are (i) relevant (i.e., they allow us to address our main research question), (ii) novel (i.e., they are untouched in the existing literature, especially from an interdisciplinary viewpoint), and (iii) amenable (to the competences of our team). Let us briefly explain why. In terms of relevance, answering RQ#1 (creation and distribution of value) clearly constitutes a first step towards understanding how SEPs can deliver long-lasting value. The next step consists in analysing more deeply the specific instruments that SEPs use to create and distribute value, namely rating and review systems (RQ#2), and pricing policies (RQ#3). 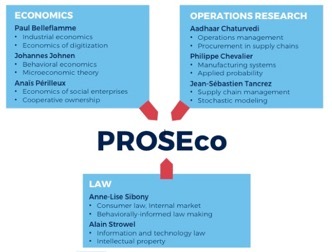 The novelty does not reside so much in the issues per se but in our approach to tackle these issues: we will not only combine the insights of three disciplines but also, within each discipline, we will mobilise fields that have been scarcely used so far to study the sharing economy (e.g., behavioural economics, consumer protection law and, basically, most fields in operations). Finally, in terms of amenability, we believe that our team proposes a set of complementary and adequate competences to address these issues in a useful and original way, as demonstrated on the figure below.